Copyright the Card Came: Australian Edition is launched! In the Australian GLAM sector, copyright knowledge and decision making is required for many aspects of operation, and to provide information to clients. 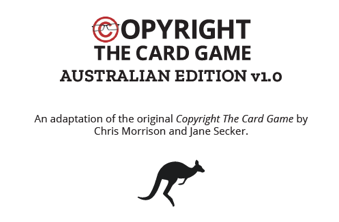 This blog post is by Nerida Quatermass and Elliott Bledsoe who were part of the team that approached us last year to adapt Copyright the Card Game for Australia. Nerida is the University Copyright Officer at Queensland University of Technology. Elliott is a member of the Australian Libraries Copyright Committee, at the Australian Digital Alliance. They tell us…. The Australian Libraries Copyright Committee has a national copyright training program for libraries and archives. Creative Commons Australia provides information about open licensing in a Resource Kit for the GLAM sector. 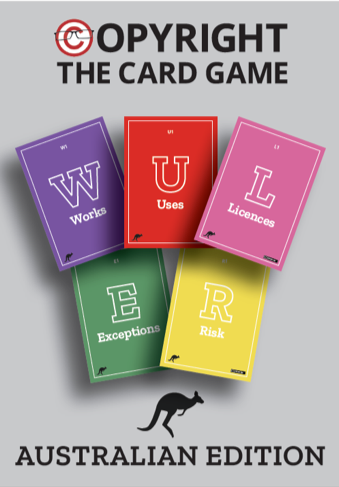 To supplement training and education the two groups decided to adapt UK Copyright Literacy‘s Copyright the Card Game to suit Australian copyright law. Like the Canadian adaption project it was recognised that the content of the game would have to be changed to accurately reflect the Australian legislative and licensing context. · Jessica Coates, Australian Libraries Copyright Committee, Australian Digital Alliance. · Nerida Quatermass, Queensland University of Technology. · Kate Makowiecka, formerly Murdoch University. · Lisa Conti Phillipps, University of New South Wales. · Elliott Bledsoe, Australian Libraries Copyright Committee, Australian Digital Alliance. After receiving this post we were really delighted to learn that Nerida will be attending the Creative Commons Summit in May in Lisbon so we are really looking forward to meeting her, and also catching up with Lisa Di Valentino from Canada who was part of the team that created the Canadian edition of Copyright the Card Game. We hope they can both bring along their cards to show off at our workshop on Playful approaches to Copyright Literacy at the Summit! Next The 2019 World Tour starts!